Looking for a fabulous showstopper cake for your family and friends this Easter? 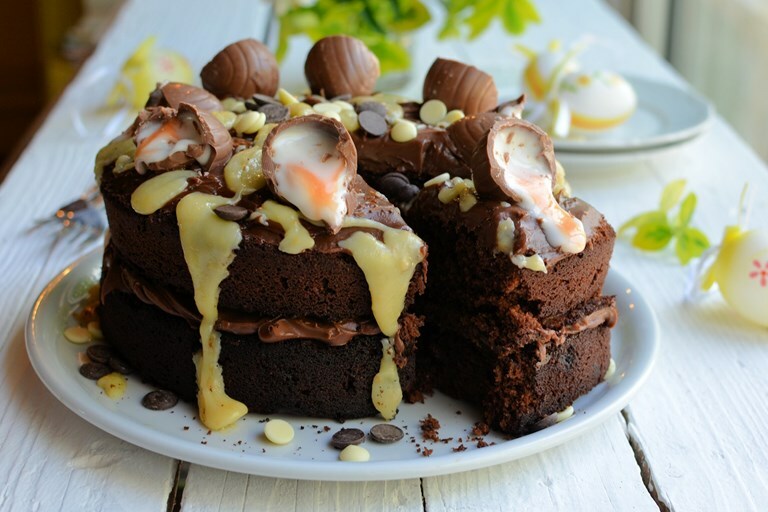 Your search is over, thanks to Karen's Creme Egg cake recipe. Easter baking at its best. I am more of a savoury person, with cheese high on my list of savoury snacks and treats; but, I do love to make a nice big family-sized chocolate cake for special occasions, and Easter is just one of those times when a chocolate cake ticks all the culinary boxes! So, when I was thinking about what kind of cake I would make this year for our Easter tea time table, I decided to turn to the latest trend for baking with Creme Eggs. On doing some research, I uncovered some amazing ideas; it appears the whole baking world has gone mad for baking with Creme Eggs this year, and I have seen Creme Egg Fudge, Creme Egg brownies, Creme Egg pancakes and even Creme Egg doughnuts too! 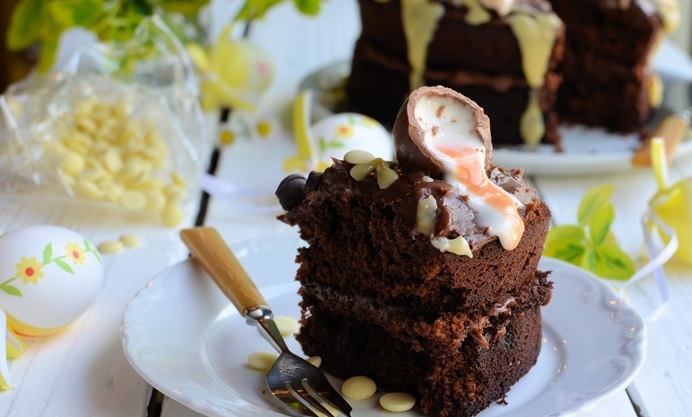 It seems that although the most popular recipes that use these iconic chocolate eggs are brownies and cupcakes, there wasn’t a large celebratory cake to be seen. Based on my research, I decided to bake a big chocolate cake, and then came the question of should I add the Creme Eggs to the baking batter, and bake them with the cake sponges, or should I add them afterwards. On doing a bit more research, I discovered that that they can become quite unstable when baked, and as I wanted a pretty cake for the Easter tea time table I decided (on this occasion) to add them as decorations, which worked perfectly as you will see from the photos. As well as adding the eggs, I also went for a cream cheese filling and frosting and used a very popular chocolate cream cheese spread. This cake serves eight very greedy people, or twelve more refined and less greedy people. One word of warning; you have to be an avid chocoholic to eat this cake, as it is very rich with its cocoa and chocolate chip sponge, white chocolate drizzle, and the Creme Eggs of course! It will make a fabulous show-stopping cake for your family this Easter, and next on my Creme Egg baking quest is a batch of Creme Egg muffins that I am also experimenting with this year! Have a wonderful Easter and do let me know what you think of my cakey masterpiece, and if you decide to make it this Easter.